Safdarjung Tomb, also called Safdarjung ka Maqbara is a beautiful garden tomb set amidst the hustle and bustle of Central Delhi. The tomb, yes as the name suggests is of Safdarjung. Safdarjung Tomb was built in 1754 A D and follows the precicints of Mughal Architecture in its full glory. The tomb though usually takes a backseat when compared to the other monuments and tombs in Delhi. The popular ones of Red Fort, Qutab Minar, Humayun Tomb, usually relegates this beautiful structure into the background. Located just off the busy stretch of Safdarjung Road, named after the tomb, the Safdarjung Tomb is hardly visible from the main road, shielded by a high wall boundary. All one gets is a wee bit glimpse of the dome rising into the sky from the Safdarjung Airport flyover, which is the greatest pity for a beautiful jewel is so totally camouflaged. Passing though the thick walls which form the boundary into the area actually takes one into another world, of leisure, open spaces, gardens…..where time literally stands still. The beautiful enamel work in stone and detailed motifs on the high walls at the entrance gate, give a precursor to what lies inside. As soon as one walks into the sunlit huge area, it is with awe one views the monument. Rising high in the traditional four column structure, with a huge dome is the tomb more on the lines of the Humayun Tomb. The four sides are connected by four waterways or canals, now dry though I am told for VVIP visits or special occasion it can work i.e. it is flooded with water. 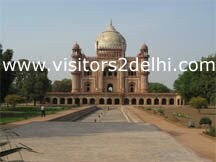 The entire structure is made of red sandstone and marble and is very striking and resembles the Humayun tomb. The tomb has some excellent inlay work which can be seen from the outside. It has some beautiful marble carvings inside. As one proceeds into the area, one is left wondering by the heavy stone construction and how it is cool despite the warm weather outside. The garden on the outside which is being renovated now has been laid in the traditional char bagh style. With the palm lined trees on either side, it is a picture of complete bliss a hark into the era of how life once was leisurely and savoured!!! The Archaeological Survey of India’s Delhi chapter has its offices located at the far end of the area. As also the library atop the entrance. Location – About 8 kms from Connaught Place, very near Jor Bagh market. Near the Safdarjung Airport. It is on the main road so well connected by almost all modes of transport. Timings – The tomb is open from Sunset to Sunrise all the days of the week. Since there is a mosque where prayers are offered. A huge car park is convenient. The ticket price Rs. 5 for individuals and Rs. 100 for foreign tourists. The parking lot at the entrance is a huge relief!! Highlight – The rooms at the top of the entrance occupy the library. It is quaint how a couple of rooms serve perfectly well in the modern century though built ages ago. The library though small has a good collection of books. Try going up, it is a revelation on the architecture and how it can sit cocooned in the modern day world! Insider Tip – There is no leaflet, pamphlet or any written material available about the tomb, so read up on it or carry a guide book along. Guides are also difficult to come by. If you can take a trip to the ASI office, may be a helpful official can explain the structure and architectural elements better. 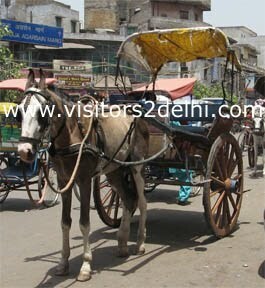 A visit to this can be clubbed with Shopping at Dilli Haat (read Shopping At Dilli Haat) or INA Market, Sarojini Market or the Jor Bagh Market, each has its specialty and charm. 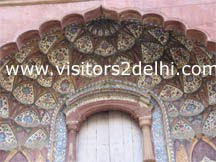 A visit to the Lodhi Gardens, Khan Market or Sunder Nagar Market is also possible. 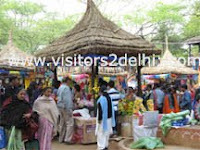 The Suraj Kund crafts Mela or Bazaar or Fair showcases the abundant wealth of Indian crafts – handloom textiles and handicrafts. It is a craft lover’s delight. 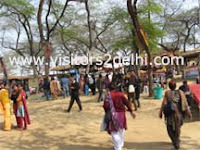 An annual event, Suraj kund Mela is held from February 1st to 15th of every year. It is awaited eagerly by hundreds of die-hard faithfuls for it brings some of the finest in Indian crafts under one roof. The Suraj kund Mela which started 1981, thanks to Harayana Tourism efforts, has simply grown from year to year. Each year is welcomed with a theme state which also constructs a theme gate encompassing the cultural history of the place. This year, 2010 theme state was Rajasthan and the theme gate inspired from the Shekhawati region of Shekhawati paintings. Yes, the colour and vigour was intact. Since the last few years, five – six years, foreign craft groups have been invited to form international partners. This year’s partner state was Tajikistan showcasing its rich embroidery, appliqué and more. Of course, the Egypt, Afghanistan, SAARC countries – Bhutan, Nepal, Sri Lanka were present apart from Thailand. It was Egypt last year. Silver from Egypt (it is beautiful), Pashmina and Rudraksha beads from Nepal, intricate embroideries and antique panels from Afghanistan, Pakistan and Uzbekistan adds to the colourful fervour. The fair is spread on one side of the Suraj Kund, a manmade reservoir as an ode to the Sun God, constructed in the 10th century. The fair follows the natural contours of the land, the rocky patches, the hills and low land amidst trees makes it perfect setting. The thatched huts where the craftsmen are housed adds to the Bazaar, Mela ambience. The joy rides, camel rides at the entrance, the Mela is complete. It is a perfect picnic spot, but with so many gorgeous offering, it boils down to a shopping spree. You name the craft it is present – bell metal crafts, tribal crafts, wood, embroidery, woven fabrics, vintage pieces, furniture, pottery, silver crafts, jewellery, sandalwood…. It is however with the crafts on display and sale that the Mela scores. The invitees are well known craftsmen – National Award winners, Master Craftsmen, State Award Winners, Shilp Gurus, Merit certificate holders, NGOs…so the craft available is genuine and from crafts persons directly. The quality of craftsmen this year was excellent though in some years it has been indifferent. The authorities do try out novel placements to see that all crafts are covered, though at times there is an influx from one state to the detriment of the other. The entire Mela ground is dotted with Orissa appliqué umbrellas, lamp shades, huge carved statues. The Chattisgarh partner state theme had excelled at offering tribal handicrafts in the past. The colourful drummers, players of traditional music instruments (ravana tarang from Rajasthan this year), the puppeteers (Rajasthan is omnipresent each year! ), snake charmers with their repertoire add to the ambience. The food is again delicious and a separate enclosure food court is exquisite. It offers a host of Indian, Continental and even food from the participating countries. It is possible to see both common and rare crafts at the Mela. Location - At the historic Surajkund a reservoir built in the 10th century by Suraj Pal of Tomar dynasty. A worshipper of the Sun God, a temple was also built on its bank. It is located amidst the Aravalli Hills and a manmade lake. It is roughly 8 – 9 kms from South Delhi. The drive from Alaknanda or Tughlakabad Institutional Area is beautiful, there is the backdrop of the Tughalakabad Fort for company, some beautiful minarets. One turns in right into the road leading to the Asola Sanctuary and the shooting range. The drive is beautiful with khikar jungle, earlier one could spot peacocks or the elusive fox on the roads, now it is only the monkeys. The drive is nice as it meanders into a curved slop pattern. One enters Haryana to be greeted by the five stars – Claridges and Charmwood high rise apartment. Opposite of which is the Mela. Timing – Held from February 1st to the 15th of every year. Morning 9:30 to evening 7:30 pm. Cost of the Ticket – Rs. 50/- per head, children below 5 years allowed free. Parking is available in front of the area and the walk from the Parking lot to the Mela is a HUGE trudge and not in the least enjoyable. Despite the high parking rates, Rs. 50 this year, the parking lot leaves a lot to be desired. It is still mud tracks which invariably gets slushy with rains. Highlight - Most of the cultural events are held in the evening. When the place comes alive with sounds of the instruments and is beautifully lit. Yes, it rains in Delhi during this time and a few days are invariably lost due to it. There is no real shelter when caught in the rain. Insider Tip - I have got to see some of the finest Cherial paintings, silver filigree, South Indian bronzes, Chitrakathi paintings, Vyanj puppets, Patola sarees, Paithani sarees, antique / vintage Kutchi embroidery.…The variety is mindboggling and sometimes difficult to cover the entire stretch in a day. During recent times though given the profile of visitors and it being a tourist destination, the prices has shot up and it has become quite expensive. Potential to bargain has come down. For food, the Institute of Hotel Management, Faridabad formerly called Food craft Institute puts up their stall offering Chana bhatura, Tikki, Samosa, Tandoori roti, thalis…. Which is pretty good as it is made by the students and the stall is also handled by them. Of course, the traditional state cuisine is also available as also pizzas, Thalis and more…. Truly on could sing, all I want is some Gajar ka Halwa. I know, in winter what with ravenous appetites it is difficult to control the craving for sweets and what tops the list are hot – piping hot halwas. Aha they are food for the souls, tasty extremely filling and leaves one feeling warm, comfortable and in love with world (despite the bitter cold ) feeling inside. The trick of the halwa is that it is packed with all natural goodness which offers warmth to the body and gives it energy for the winters. So it is ghee (clarified butter), dry fruits – almonds, raisins, milk (for gajar ka halwa), suji (semolina), crushed moong dal. 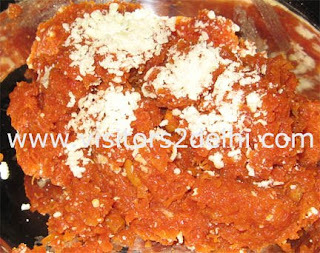 Gajar ka halwa or Gajrela as it is popularly fondly called beats the halwas hands down during winters. It is made from the English variety of carrots which makes its appearance in the cold season. And with it starts the romance with the Halwa. The quickest way to make it at home, is to simply grate in the carrots, add the sugar, milk, ghee and pressure cook. Decorate with raisins, khoya and serve. Though strictly “No comments” on its taste. Purists will scoff at it, (as does yours truly also except when she makes it in a jiffy then it is defined aka 2 minute halwa!!!) The true delight as my mother makes is to simply heat the grated carrot to remove the fluid from it, slowly cook it with milk, ghee, sugar, the adornment with raisins, khoya…I am not sure of the proper order but well, the halwa is mouth watering. The other best of course is to buy from the market – aah and are they plenty in their offering. A couple of spoonfuls is enough to warm the cockles of the heart. It does become heavy on the stomach is devoured in greedy proportions. Moong dal ka halwa is made out of moong dal (split lentils – mung beans), heavy duty roasting slowly in pure ghee to which huge quantities of almonds, raisins, walnut…. (dry fruits – mawa) are added. It is so rich that a couple of spoons are enough satiations for the stomach and soul. Nearly all sweat shops sell gajar ka halwa & moong dal ka hawla during winters, one just needs to pick one’s favourite. Gianji’s - Their gajar ka halwa and moong dal ka halwa is wonderful in the evenings. Their outlets dot the city. Nehru Place is dotted with shops selling gajar ka halwa. There is one next door to Sharma Photocopy where it is divine. Bikanerwala, Haldiram’s, Rameshwar, Anupam, Nathu’s…. Timing – It is available from morning 10:00 am till late into the evening. There is no best time to eat but it is to beat the evening cold, both the halwas come to their own. The price ranges from Rs. 200 per kg to Rs. 350 per kg. A plate can cost anywhere from Rs. 10/- or more. Highlight - I think nearly every halwai in your nukkad (round the corner) market offers it and one develops a sweet tooth for it. Each to his own favourite joint when it comes to eating Gajar ka halwa and moong dal ka halwa. Insider Tip - What further adds to the halwa is that the gajar ka halwa, the glorious one is available only during this weather. And the other hot favourites like moong dal ka halwa, lauki, seethaphal, sohan halwa, Karachi halwa….the commonplace suji..the feast is a true fit for the gods. It does taste heavenly when combined with other sweets – Gulab Jamun, Ice-cream, kulfi….take your pick or simply enjoy the ghee dripping delights!!!! There are other sweets eaten hot during winters – gulab jamun, malpuas…..that is of course musings for another day and post. Delhi is a huge melting pot of influences which is amply reflected in its cuisine. Today, the melting pot assimilates national, international cuisine, some cuisine “adapted” to Indian taste well – Chinese a huge example in this direction. 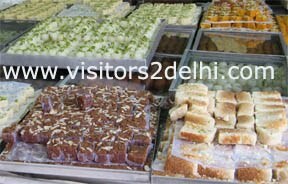 Delhi offers innumerable places to eat, each having its own traditional offering. The food palette includes almost all kinds of food from India and a delectable spread of International Cuisines. Traditional Indian food is classified apart from geographical bearings as per caste, religion. The nuances are plenty as also the range of spices, condiments and vegetables, fruits, cereals, meat, rice …that is added. The Capital’s foodaddiction includes the classy Chandni Chowk fare – the Delhi Bania style of cooking in pure ghee without the use of onions, garlic, the Mughal style of kababs, biryani, the Punjabi touch of Pindi chole, Rajma chawal…Regional cuisine can be tasted from spicy Andhra Fare, Namma Tamil sapadu (Karol Bagh, Lodhi Road..), Malayali fare of puttu…Gujarati, Rajasthani snacks and thalis, Parsi, Iranian, Anglo-Indian fare…..Yes, it is food lover’s paradise. No pun intended, a friend’s husband on a visit to Delhi from Kerala, asked in all innocence “don’t people cook at homes, the food stalls are always so very crowded”!!! This section tries and captures some of the best to be indulged in Delhi. No, this is neither a “eating out of the street” kind of a vengeance section neither “oh how can they eat street food – with emphasis only on chic upmarket cuisine” atitude. But in turn it is a slave to the taste buds, yes anything that tastes good, is different, has you ruminating about its glory during the day and pursuing it salivating in your dreams. Being a vegetarian, an eggetarian to be precise, the non-veg food section might not be justifiable but I shall make amends with recommendations from die hard “only non-veg” friends! The oft repeated word one hears every morning is, "boni ka time" or "Boni kar do" . "Boni" is the first deal of the day to be clinched by the seller. The belief being that if the first deal for the day is made without much ado and in the hands of a prosperous customer, the rest of the day will proceed well and will not cause any problems. Since, for a seller the getting of the blessing of the Goddess of Wealth is of primary importance, he goes to any extent to procure it. up and paid up a couple of rupees extra. He immediately touched the money with his eyes and circled the meter. You bet, he should thank it for giving him the extra bit. hemmed and hawed and finally said, " It is early in the morning and you are my first patient", so I paid her fees in the name of Boni. The same action of touching the eyes with the money was carried out. A similar story was repeated at my cousin's tuition class. They had weekly system of paying and she being the first student on the pay day, gave the money. The teacher took it, touched it with his eyes, offered it to the statue of Lord Ganesh and Goddess Laxmi before locking it. And here was I thinking they were both indebted to the Goddess of Learning for giving them the skills. Observe this practice in the office of any professional - be it a lawyer, architect or tax consultant, you would know what I mean. Of course, Vidya (Knowledge) and Vaidya (medicine) should be made available at a price otherwise it does not seem valuable to the recepient, but its emphasis now seems to be purely monetary . The various professions hitherto differentiated on respectability, dedication and nobleness seemed to be tied together with its preoccupation on Nakkad Narayan. Avocations supported by Goddess Saraswati, Vishwakarma and Dhanvantri (medicine) seemed to be dedicated to Goddess Laxmi and Kuber. the commercial success of that day. Everything is a Dhandha.